Normally you will export to .wav or .mp3 audio files to be played in a media player, car stereo or hi-fi. The final mix is exported from FL Studio using the export option in the file menu in a non-real time process called 'rendering'. The time taken will depend on export settings and project complexity. Rendered audio is usually better quality than the live sound from FL Studio. Master Mixer Track - By default, the Master Mixer track is rendered, unless you are using 'Split mixer tracks'. This means any Mixer Track not routed directly, or indirectly to the Master won't be included in the render. Audio - .wav, .mp3, .ogg & .flac formats save an audio mix of your project. By default, the Master Mixer track is rendered, but you can export individual Mixer tracks with the 'Split mixer tracks' option. See the note below on including sounds from external synthesizers and audio hardware. MIDI - .mid saves Step Sequencer / Piano roll note data to standard MIDI files. MIDI is not an audio format. 'Song mode' - Length is set by this hierarchy: 1. Any time-line selection, 2. The last time-marker beyond the last bar containing data. 3. The end of the last bar containing data AND 4. The Tail setting. 'Pattern mode' - Length is set by this hierarchy: 1. The last time-marker beyond the last bar containing data in the Pattern. 2. The end of the last bar containing data in the Pattern AND 3. The Tail setting. Saving projects - Exporting to audio is not necessary to save your project for later work, use the File menu project Save option to .flp or .zip. Make MIDI connections to the device from your computer AND audio connections from the device to your audio device inputs. Record the sound as it is played by FL Studio (using a MIDI Out plugin to drive the hardware). Place the recorded audio as an Audio Clip in the Playlist. Render the project to audio as shown below. We recommend watching the video A Digital Show and Tell (by Monty @ Xiph.org) to learn about how digital audio works. It will help you to understand why more and higher settings for 'everything' is not necessarily better. Mode - Choose to render the whole Song or the currently selected Pattern. In 'Song' mode, the length of your rendered song rendered is set by this hierarchy: 1. Any time-line selection, 2. The last time-marker beyond the last bar containing data. 3. The end of the last bar containing data AND 4. The Tail setting. Tail - Decides how decaying effects, after the end-point of the song, will be handled. For example, normally you don't want the decaying reverb chopped off at the end of the song (leave remainder) or, if you are creating loops blending the end reverb back into the start can make the loop smoother (wrap remainder). Leave remainder is the default. NOTE: If you are making loop files use .wav format, .mp3 in particular leaves a small silence at the start of the sound that will interfere with looping. Leave remainder - Extends the render length to capture decaying sounds. 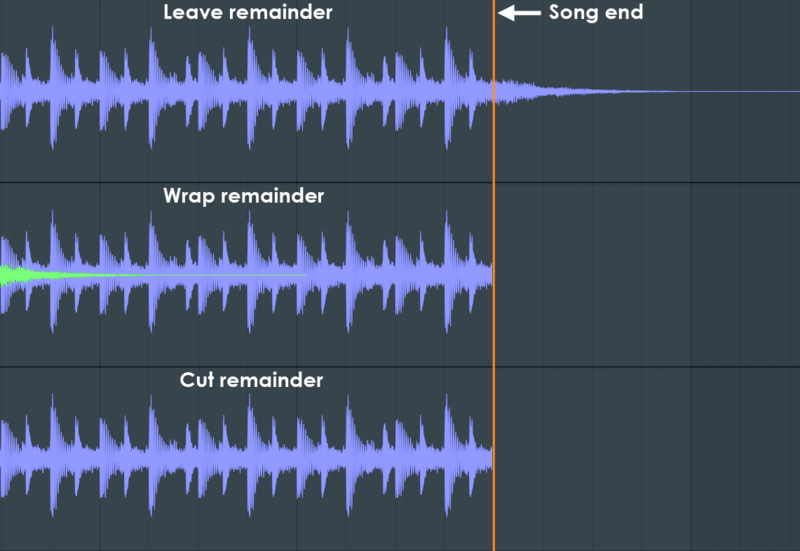 If 'Leave remainder' fails to capture tail audio, add a Playlist Repeat marker to extend the render end-point. If repeat markers are placed after the last Pattern, Audio or Automation Clip in the Playlist, the project will be rendered up to the position of the Repeat marker. Wrap remainder - Wraps any decaying sound at the end of the song back onto the beginning of the render. This is useful when rendering loops with effects to create the smoothest loop. NOTE: This feature works by starting the render at the last bar, then mixing any audio decaying after the last bar back into the start of the song. If the decaying sound comes from notes before the last bar it won't be wrapped. Cut remainder - Cuts the render at the end of the last bar, selection or time marker. Length - Reports the length of the song, pattern or selection in bars to be exported in Bars. Total Time - Shows total time length of the song, pattern or selection to be exported in H:M:S.
Disk Space - Shows the disk space required to hold exported audio file/s. If more than one save format is selected in the Output panel the combined total is reported. Select the output format/s for the project render. To save in more than one format simply select multiple options. NOTE: Sample rate - The output (Mixer) sample rate is set in the Audio Settings window. WAV - Wave (Lossless Uncompressed Audio). Wave is a lossless audio format and preferred for handling audio in a production environment (use it to save all your samples, sounds and archive material). The drop-down menu contains bit-depth options for the exported wave file. WAV bit depth - Bit-depth affects the noise-floor of the sample. This determines the quietest sound that can be captured or smallest changes in loudness that can be resolved. Generally 16 Bits is enough for music distribution. Use 24 or 32 Bit for archiving music production files. 16-Bit integer wave is the highest-quality audio file compatible with a wide range of playback devices. It's also the CD audio format so if you want to create audio files compatible with CD format use 44.1 kHz, 16-Bit .wav files make sure to set 44.1 kHz in the Audio Settings window. NOTE: FL Studio does not burn to CD format, it creates audio files ready for burning. Use any VST CD burning program to create the audio CD. 24-Bit integer wave is a common bit-depth used by DAW hardware & some older DAW software. Use this bit-depth if 32-Bit (see below) float is not supported by the device or application. 32-Bit floating point is the native format of FL Studio's mix engine. Render to 32-Bit float when you intend to continue mixing or editing the file in another application (wave editor or DAW) that supports the 32-Bit float format. 32-Bit float provides more precision for audio processing and so will ensure the highest quality is preserved during post-production activities. Sample rate (not shown here) - Set the FL Studio project sample rate in the Audio Settings. Sample rate affects the highest frequency that can be captured by the sample. Values between 22000 Hz (22 kHz) and 192000 Hz (192 kHz) are possible. As 44100 Hz (44.1 kHz)is the CD standard and is capable of capturing the entire frequency range humans can hear (20 Hz to 20 kHz), use it. You should have a specific reason for using sample rates above 44.1 kHz. For example, video often uses 48 kHz as the default sample rate for audio. Set the FL Studio sample rate in the Audio Settings. Channels - Number of channels in the file. NOTE: These are 'stereo' channels not 'Instrument Channels'. Stereo - Two channels for the Left and Right speakers. Mono (merged) - One channel where the left and right channels are merged into a single channel. Mono (left only) - One channel where the left channel data is saved as a Mono file. Mono (right only) - One channel where the right channel data is saved as a Mono file. MP3/OGG - Lossy Compressed Audio: MP3 (Mpeg Layer 3) and ogg(Ogg Vorbis) are both 'lossy' formats that compact the audio to save space. This means that at lower bit-rate settings you may hear unwanted artifacts often described as 'underwater sounds' or 'bubbling'. The slider sets bit-rate of the mp3/ogg audio file, as bit-rate increases the audio quality improves, but at the expense of file size. What bit-rate should I use? 64 kb/s (or less) is useful for low-quality internet 'demo' tracks. Compression artifacts will be noticeable. 128 kb/s is the point where 'acceptable' quality starts for the majority of people. It is useful for web streaming and e-mailing music files. 160 kb/s is the point where it becomes difficult for many people to distinguish CD from MP3 (not discerning FL Studio producers, of course). It is a good minimum bit-rate to use for music distribution and listening purposes. Some material may still produce audible compression artifacts. Listen carefully to the entire track with headphones if quality is important and consider a higher bit-rate. 224 kb/s (or greater) and mp3/ogg become practically indistinguishable from CD under normal listening conditions. It is a good minimum Bit rate to use for archival of a quality compressed copy of audio. bit-rates of 224, or greater, can be useful when collaborating over the Internet and you need to share audio files that may be impractical in CD .wav format (1400 kb/s). NOTES: The maximum bit-rate for MP3 is 320 kbps and 450 kbps for ogg. The relationship between kbps setting and the audibility of artifacts will depend on the material being rendered and the listening environment. You should always check your rendered files with a good pair of headphones prior to release. Sample rates - the MP3 standard only supports 3 rates (32000, 44100 and 48000 Hz). Setting the FL Studio sample rate outside these values will result in MP3 rendering errors. The MP3 conversion introduces a small silence at the start of the file in addition to the original audio. For this reason it's not suitable for use where time-alignment of the audio is critical (loops, samples, vocal tracks etc). Where possible use at least 16-Bit .wav format when sharing or saving audio in a production environment. FLAC - Lossless Compressed Audio. FLAC (Free Lossless Audio Codec) is similar to WAV format in retaining all audio information in the encoded waveform. FLAC has the additional useful property of significantly compressing (reducing) the file size. FLAC files are typically between 20 to 30% smaller than the equivalent WAV file, all while retaining a bit-perfect copy of the original data. NOTE: This is file-size compression, similar to .zip etc, not audio-level compression. Compression Level - This setting determines the effort put into reducing the size of the audio file. The difference in file size between level 0 (least effort) and 8 (most effort) is usually around 10%, a relatively small difference, prepare to be underwhelmed. 0 - Fastest compression, slightly larger files. 8 - Slowest compression, slightly smaller files. NOTE: All FLAC compression settings are bit-identical after decompression (lossless is lossless). Given the differences in file sizes between compression settings is minimal, it doesn't matter much which one you use, it only affects encoding time. The typical encoding time for a setting of 0 is around 4x faster than 8. FLAC bit depth - Choose 16 or 24 Bit. See the WAV format section for a discussion on bit-depth. NOTE: FL Studio automatically imports FLAC files and converts them to WAV format, when loaded on the Playlist or in plugins such as Edison or Slicex. Make sure to save your project in its current state, the next step will replace Channel instruments. Use the macro Prepare for MIDI export on the main Tools menu that replaces all Channels with auto-configured MIDI Out plugins. This is necessary to export project-wide MIDI in the correct multi-channel format. To export individual Piano roll data as MIDI files use the Piano roll menu option 'Export as MIDI file'. Select MIDI on the Export Project Dialog and press Start. Don't save your project in this state you will lose the original Channel settings. Save to a new project if required. NOTE: MIDI is not an audio format. If your media player can play MIDI files it is using the synthesizer/sampler built into your audio device to create audio from the MIDI data. Linear interpolation is the fastest method. It provides basic linear averaging between samples, however it can result in aliasing (high frequency noises) if samples are transposed far from their original pitch. 6-point Hermite has been optimized to be a quick curve interpolation method with superior quality to linear interpolation. It is ideal for exporting 'working drafts' of your audio files. 64, 128, 256, 512-point Sinc methods provide increasing quality interpolation, but they are also very slow. We recommended that you use at least 64-point Sinc on your final render, or better still, the maximum Sinc value that you are prepared to wait to finish rendering. NOTES: 1. This video covers Aliasing and Interpolation. 2. There is an independent live audio interpolation set on the F10 > Audio Settings, Mixer section. If different Mixer and Render interpolation options are set, this will cause the live and rendered audio to sound different, specifically in the high frequency regions. Aliasing can create a 'false' high frequency brightness. Setting the live interpolation method to 64-point sinc will minimize this problem, should it arise OR you may like to render with the same setting as the live interpolation to preserve these artifacts. HQ for all plugins - Sets high quality mode for any native FL Studio plugins (effects, instruments & sampler channels) used in the song. VST plugins may also render in HQ mode if the Wrapper setting Notify about rendering mode is selected. Disable maximum polyphony - Ignores the Max poly setting in Miscellaneous Channel Settings but does NOT ignore Mono option if selected. Dithering - Applies 32 to 16-Bit dithering to 16-Bit .wav and .mp3 files. Dither should only be applied once to 16 Bit audio file during the final render (if at all). FL Studio uses a 'shaped' Dither algorithm that shifts most of the dithering 'hiss' above 10 kHz. What is dithering? Simply, hiss. Yes really. Dithering randomizes the value of the least significant bit when making bit-depth conversions (32 to 16 for example). The least significant bit in the digital audio file represents the smallest possible change in output level. This then is noise added at about -96 dB for 16 Bit export. The purpose of dither is to break up the predictability of rounding errors that happen during the bit-depth conversion. Rounding errors affect only the value of the least significant bit so dithering randomizes this value (0 or 1), according to the dither formula used. If dithering is not used, these rounding errors correlate with the audio signal and so generate alias frequencies. When dithering is used these alias frequencies are replaced by an additional background hiss. Hiss is generally less distracting or noticeable than aliasing and so dithering has become a standard process to apply to the final 16 bit render ready for CD. NOTE: Both the bit-reduction induced aliasing noise (without dither) or the hiss (with dither) is only audible in very, very quiet parts of a recording, where the music is approaching the limits of the bit-depth AND you have the volume turned up very loud. If you are hearing noise artifacts and your track is playing at normal listening levels, then it is some other type of noise, probably resample based aliasing (see the interpolation settings) or compression artifacts (mp3/ogg bit-depth). There is a lot of nonsense written on music forums about the benefits of dithering. Remember, it's randomization of the least significant bit. It does not add 'sparkle', 'punch' or 'bass'! It replaces one very low level noise (aliasing) with another (hiss). Various dither types you may see discussed, are just different tonal variations on the dither-induced hiss. Save playlist markers - Slice markers will be saved to .wav format files at each Playlist Time Marker. Save loop markers - Saves loop markers in .wav files. Useful for creating looped samples for use in Sampler plugins. Save note markers - Each Note and Audio Clip (start) in the project adds a slice marker to the exported audio file so exported audio is perfectly sliced, ready for use. Use sliced loops in plugins such as Fruity Slicer and Slicex OR in the Playlist, with the specialty time-stretching options Time stretching > Mode > Slice stretch and map. NOTE: As each note and Audio Clip adds slices, complex projects will quickly get out of hand. 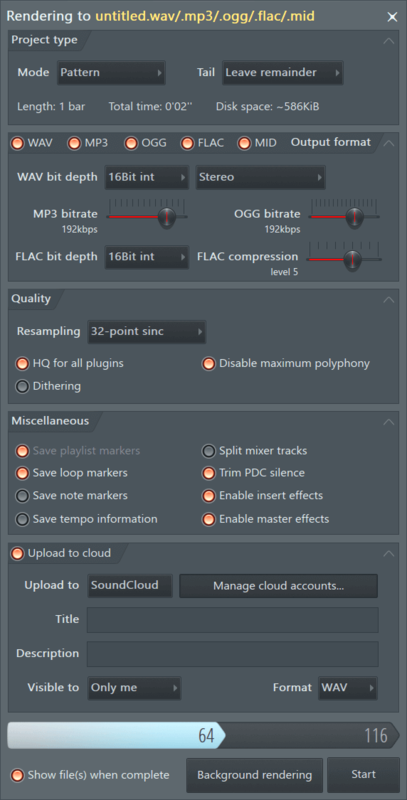 Use this option with a few Channel Samplers, FPC or a limited number of note-driven plugins to specifically create sliced loops. Save tempo information - Saves project tempo in .wav files meta-data format. Useful for programs that can read this data type. NOTE You can change the tempo using the Edison Sample Properties dialog and the slice/region markers in Edison's wave-edit window. This option does not export to flac/mp3/ogg formats. If you are using plugins with multiple-outputs to Mixer tracks, make sure the Mixer tracks have been renamed from the default 'Insert N' format. FL Studio uses this to flag they are being used, and will render them. Master FX are only included on the Master Track export. To include Master Effects use the Playlist Menu > Consolidate feature. Muted Mixer tracks, including the Master, will not be exported. Trim PDC silence - The default is ON and applies only to exported .wav files. As PDC can add a delay to Mixer Tracks, this option decides if the PDC delay is rendered, or not. When selected, any PDC that was added to the Master Mixer Track or Split mixer tracks (see above) is removed from the start of the rendered .wav file. When deselected the PDC remains as a short period of silence equal to the PDC setting of the source Mixer Track. NOTE: This does not turn PDC on or off, it just decides if any PDC is rendered at the start of the .wav file. See also: Latency compensation this removes delay caused by the ASIO Buffer length setting during recording. If you have already recorded the audio, it's too late, you will need to manually align it to the Playlist if it has a delay induced offset. Sometimes unwanted rendering delays can be caused by Plugins Behaving Badly. Enable insert effects - When selected, effects from the Insert Mixer Channels are included in the audio files. For more details, see 'Bouncing Patterns to Audio'. Enable master effects - When selected, effects on the Master Mixer channel are included in audio files exported through or from the Master. For more details, see 'Bouncing Patterns to Audio'. This option has no effect on 'Split mixer tracks' rendering as they bypass the Master. Background Rendering - Minimizes and renders in background mode, allowing you to work on other applications. Start - Starts Rendering. The name will change to Abort once rendering is underway. See here for some ways to launch a command prompt in Windows. This allows you to batch-process project and MIDI files. Windows Rendering audio files - Open a Command Prompt window. All projects in a folder (including sub-folders) using a complete path - FL.exe /R /Emp3 /Fc:\src\, where c: is the target drive, src is the path to folder with .flp file and project.flp is the target project to render. Single project - FL.exe /Emp3 /R c:\src\project.flp, where c: is the target drive, src is the path to folder with .flp file and project.flp is the target project to render. All projects in a folder (including sub-folders) using a complete path - Open "/Applications/FL Studio.app" --args -R -Emp3 -F"/Applications/FL Studio Mac Beta.app/Contents/Resources/FL/Data/Projects/Demo songs/"
Single project - Open "/Applications/FL Studio.app" --args -R -Emp3 -F"/Applications/FL Studio Mac Beta.app/Contents/Resources/FL/Data/MyProjects/Target Project.flp"
/R: - Render project.flp to an audio file. The optional filename parameter (extension is ignored, path not) specifies the output filename. If no filename is specified, it renders to project.wav. /M:. Render all flp files in the folder to a MIDI files. /BMP: - Turn the Wallpaper to Piano roll feature on. No options.